PIRLS, directed by the International Association for the Evaluation of Education Achievement (IEA), assesses the reading skills of pupils and gathers extensive background information about pupils’ learning environments at school and at home every five years. In the latest survey carried out in 2016, with results published in December 2017, more than half a million pupils took part worldwide, including those from England and Northern Ireland, providing a rich source of information. Powerful insights emerge into how well education systems are functioning internationally and how teaching and learning of reading can be improved. The good news is that Northern Ireland and England were among the top performers in PIRLS 2016. The countries with the highest reading scores worldwide were the Russian Federation and Singapore. These were the only countries who significantly outperformed Northern Ireland and only seven countries scored significantly higher than England. Northern Ireland scored similarly to the Republic of Ireland, Finland and Poland, while England was on a par with Norway, Taiwan and Latvia. PIRLS enables us to investigate the characteristics of a “good reader”, and it found that, internationally, “good readers” had an early start in literacy learning, with home learning environments that were supportive of literacy and had a positive attitude towards reading. In terms of schooling, good readers attended well resourced, academically oriented schools that had a safe school environment. Pupils who attended school regularly and were not tired or hungry generally had higher reading attainment. More girls than boys were good readers – girls significantly out-performed boys in all but two countries. Phonics scores relate to PIRLS performance as it was found that pupils in England who reach the expected standard in the phonics check were among the highest scoring in PIRLS. As an increasing number of children in England are now reaching the expected standard in phonics, it will be interesting to see whether this translates into higher scores in the next cycle of PIRLS in 2021. Factors such as eligibility for free school meals (FSM) and the number of books in the home (PIRLS’ indicator of socio-economic status) were also linked to how well a pupil performed in PIRLS 2016. Ethnicity and having English as an additional language did not act as predictors of PIRLS performance. Are teachers proud of the work that they do? The survey also gathers information from the teachers and headteachers/principals of the pupils taking part*. Teachers of PIRLS 2016 pupils were asked questions to determine levels of job satisfaction. More than two-thirds of the teachers in Northern Ireland were very satisfied with their job, with one-half of the teachers in England reporting the same. The chart (below) illustrates teachers’ responses, and suggests they were frequently proud of the work that they do. Teachers in England generally reported being less content than those in Northern Ireland and internationally. Fewer teachers in England and Northern Ireland appeared to find their work full of meaning and purpose than was seen internationally. 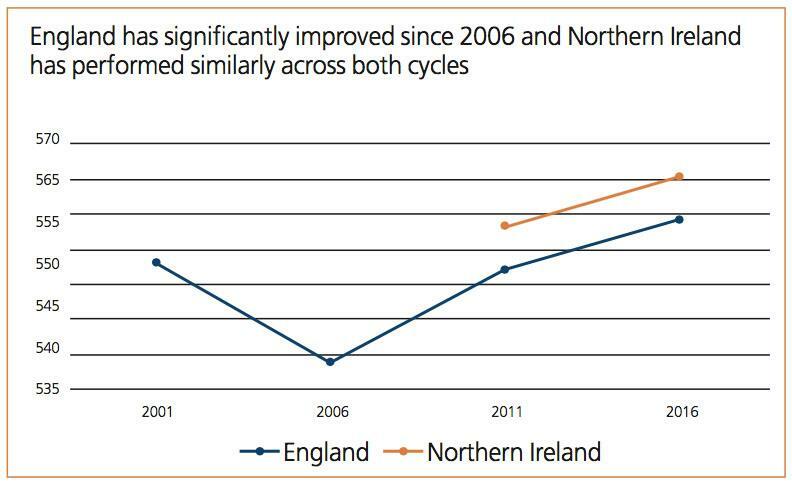 England and Northern Ireland differed in terms of the experience of the teaching staff. The majority of pupils from England were taught by teachers with up to 10 years of experience, and had headteachers with up to 10 years of experience. For Northern Ireland, pupils were more likely to attend a school with a principal who had taught for at least 10 years, and be taught by a teacher with more than 10 years of experience; in fact 45 per cent were taught by teachers with experience of 20 years or more. Principals in Northern Ireland were more likely to report being affected by resource shortages (e.g. supplies, teaching materials, teachers with specialist knowledge etc) than headteachers in England, but the proportion of pupils reportedly affected by this shortage was lower than was seen internationally. England and Northern Ireland were both among the nations whose headteachers/principals reported the highest emphasis on academic success. The scale for measuring emphasis on academic success included a range of factors, such as teachers’ understanding of the school’s curricular goals, teachers’ ability to inspire pupils, parental commitment to ensure that pupils are ready to learn and pupils’ ability to reach academic goals. Internationally, pupils in schools reporting a high emphasis on academic success scored significantly higher in PIRLS than those in schools reporting a lower emphasis on academic success. PIRLS has been conducted every five years since 2001. England has participated since its inception and Northern Ireland participated for the first time in 2011. Although the graph below demonstrates that the 2016 PIRLS scores for England and Northern Ireland were higher than in 2011, only England’s 2016 score was significantly different. This reflects a rise in attainment for lower performing children in England, but their higher attainers have not improved to the same extent. Boys in England, generally lower attainers than girls, have improved the most between cycles and consequently the gender gap in reading appears to have decreased. In contrast, in 2016, Northern Ireland had a higher proportion of pupils at the highest levels of reading than in 2011, but showed no significant improvement for lower attainers. These findings raise interesting questions for further analysis to explore what works for pupils at different stages of skills development. Rachel Classick is a researcher with the National Foundation of Educational Research (NFER). McGrane, Stiff, Baird, Lenkeit & Hopfenbeck (2017). Progress in International Reading Literacy Study (PIRLS): National Report for England. Oxford: OUCEA. Sizmur, Ager, Classick, and Lynn (2017). PIRLS 2016 in Northern Ireland: Reading Achievement. Slough: NFER. * Sampling procedures ensure the pupil samples are representative, but findings from the headteacher/principal and teacher questionnaires may not be representative of England and Northern Ireland’s workforce as a whole. Findings should not be over-generalised to provide a single national picture of teaching staff.